Promoting Health through Sports | Yakult Honsha Co., Ltd.
Yakult owns the Tokyo Yakult Swallows professional baseball team and many fans enjoy their games during the season. 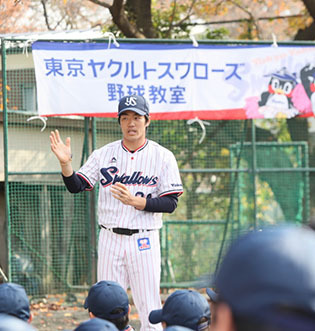 In the offseason, the Tokyo Yakult Swallows hold baseball clinics at various locations in cooperation with marketing companies throughout the country. These clinics are for primary and junior high school aged children with the aim of getting them to experience the enjoyment of sports and the preciousness of good health through exchanges with professional baseball players. The Yakult Group takes on activities aimed at promoting Bound Tennis, a sport that anyone can enjoy anytime, anywhere. 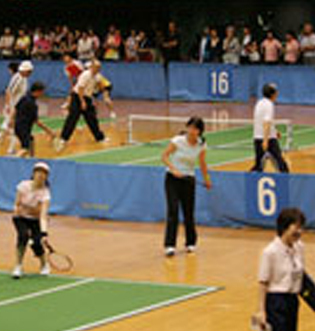 Bound tennis is a sport that originates from Japan and was devised by combining the rules of tennis with hints of racquetball in 1980. The Yakult Group cosponsors all the block and prefectural competitions held throughout Japan, including the national championship. 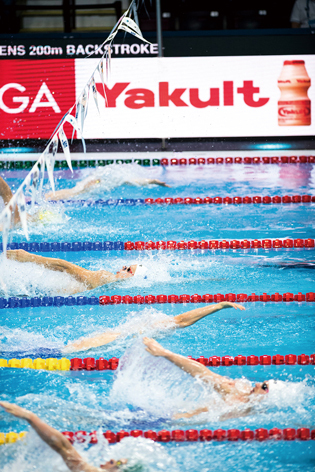 Since 2005 Yakult has cosponsored the FINA World Championships and the FINA World Swimming Championships (25m) as an official partner of the Federation Internationale de Natation (FINA).